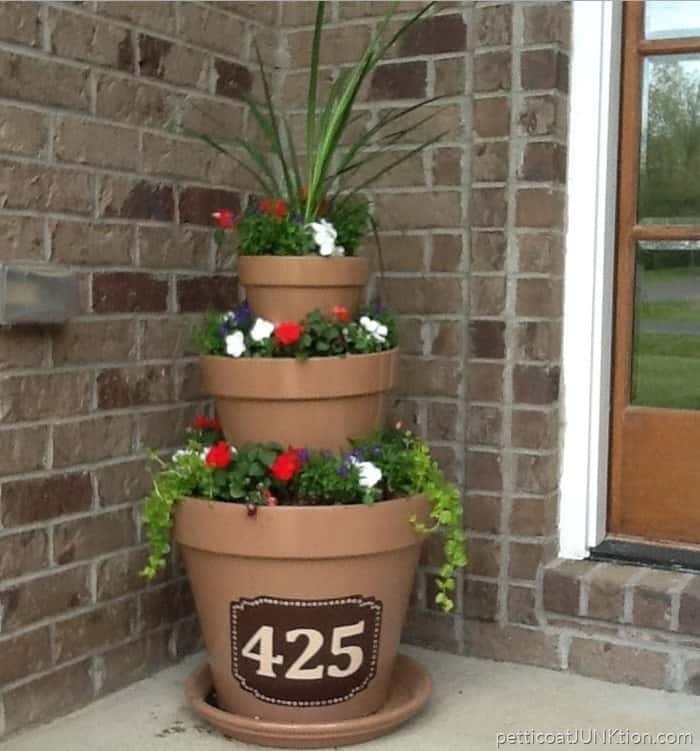 This red flower planter will add instant curb appeal. 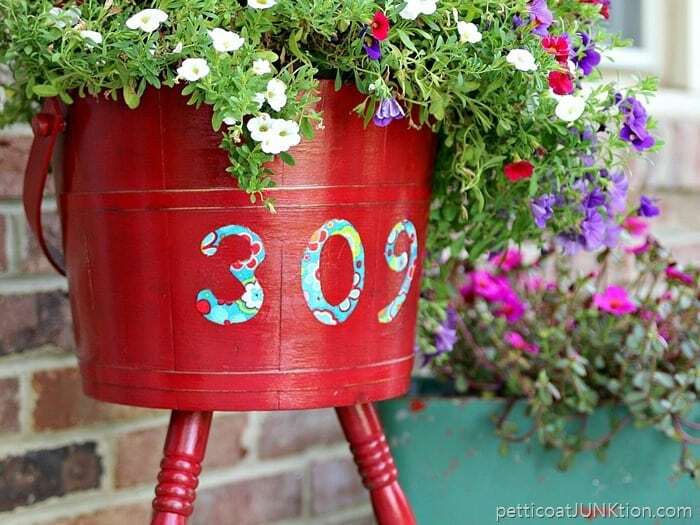 The decoupaged address numbers on the red wood planter are a nice contrast and can be seen from the street. 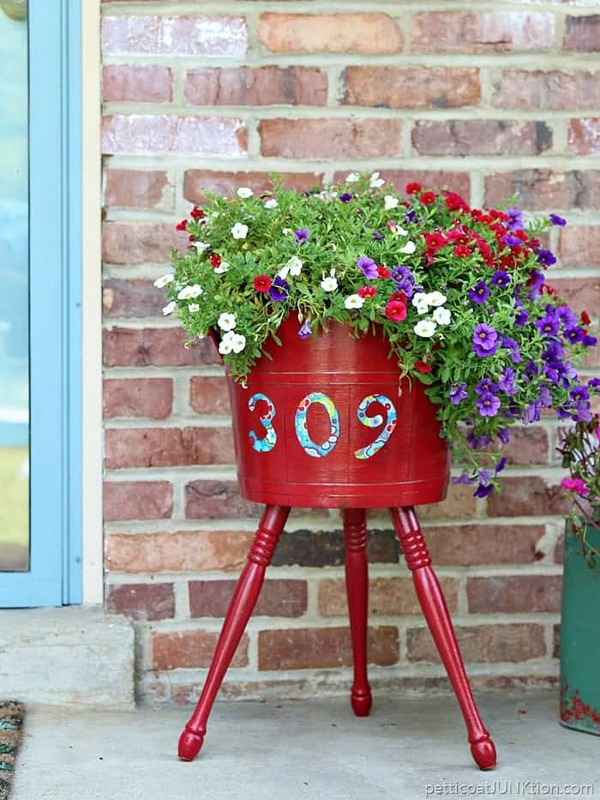 I have the full tutorial on the Red Mod Podge Decoupaged Outdoor Planter. I want to thank Mod Podge for this beautiful makeover. 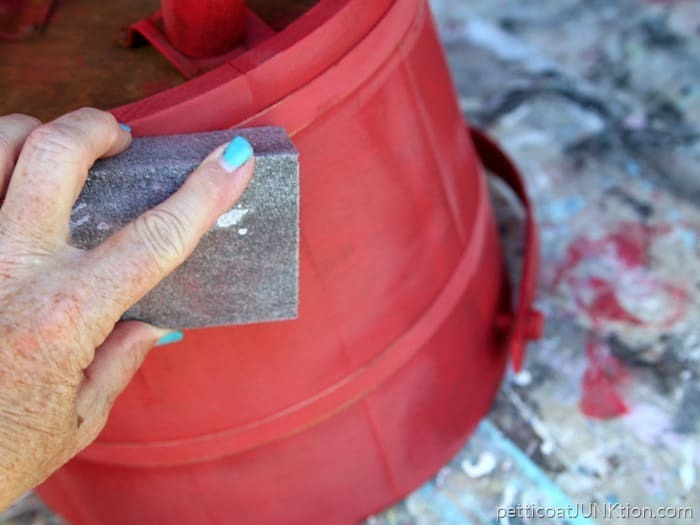 I painted the flower planter a bold red and sealed it with Mod Podge Outdoor Formula to protect it from the weather. This month the Plaid Creators were challenged to select a home decor trend and create our own version using a thrift store find. Well, you guys know that challenge was right up my alley. That’s kind-of what I do. My inspiration for the project is this flower tower I spotted on Pinterest. My project piece is a vintage sewing table from my local flea market/antique shop. It was a good buy at $12. Now for the nitty-gritty. I turned the table upside down and started painting from the bottom up…or down. 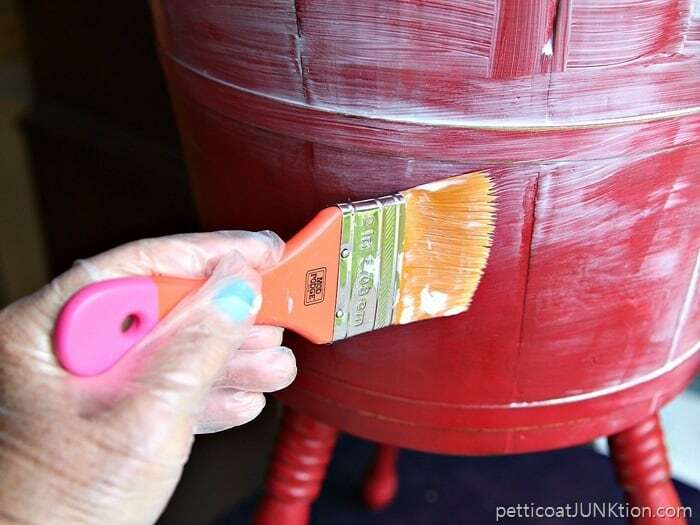 Do you see all the dull rubbed areas where I distressed the paint? That goes away when the piece is sealed. Instead of using wax I sealed the paint with Mod Podge Furniture Gloss. Now, I didn’t want just plain old stenciled numbers. The beautiful flower print fabric with red, turquoise, and yellow flowers was in my stash. Why not use it to make the address numbers? To make the numbers I turned the fabric to the back side, flipped the numbers over, and outlined them with a pencil. Cutting them out was the hard part. 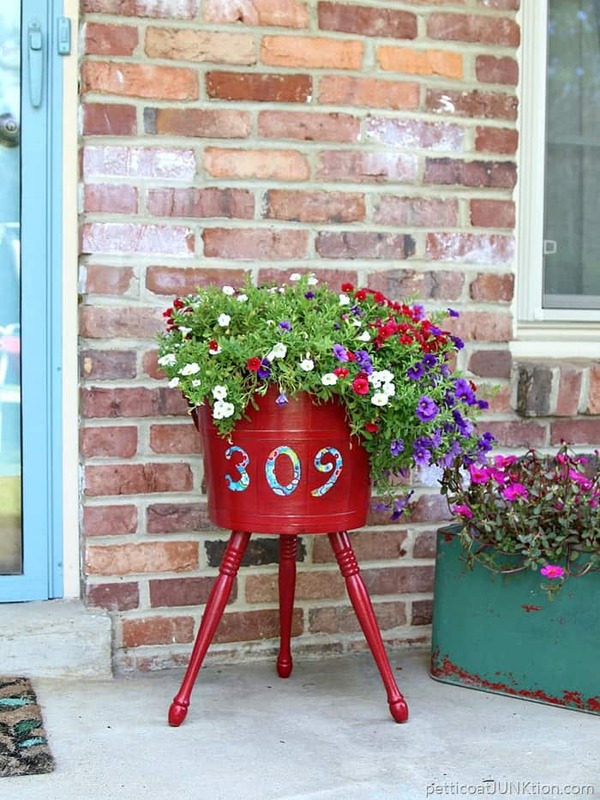 I applied Mod Podge for fabric to the numbers and adhered them to the table/planter. 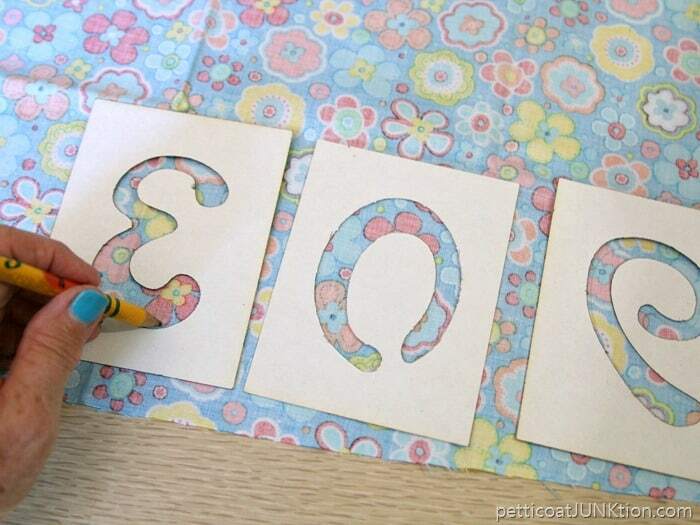 Did you know about the fabric formula from Mod Podge? There is also an antiquing formula, a glitter formula, a paper formula, and …..that’s all I can name off the top of my head. After the numbers dried I brushed a coat of the fabric Mod Podge over them. 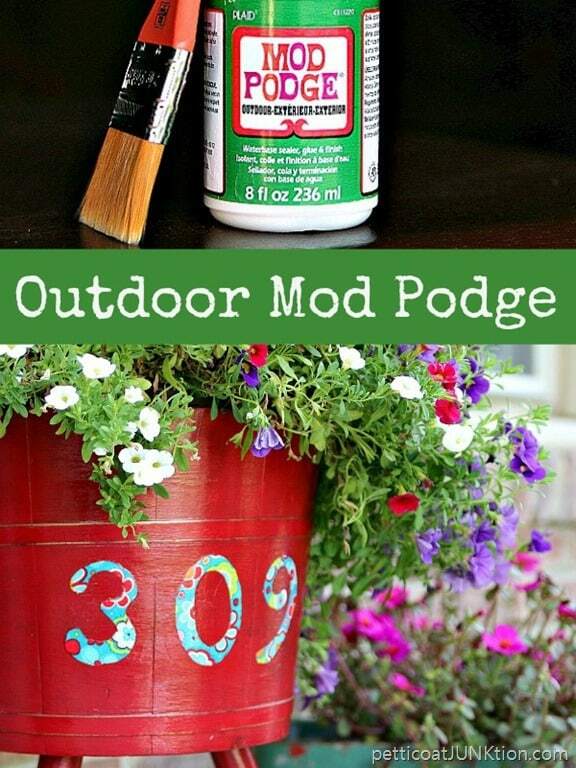 The formula that allows me to use my beautiful red planter outside……Mod Podge Outdoor. 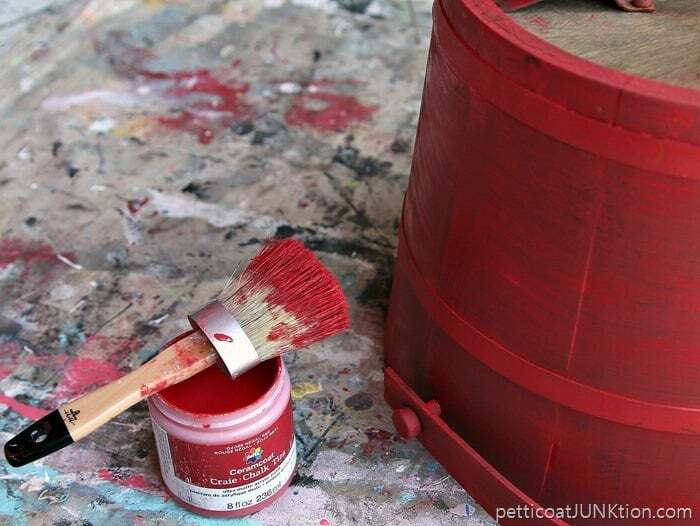 I applied three coats of the outdoor formula allowing each coat to dry before applying the next coat. Now isn’t that pretty. 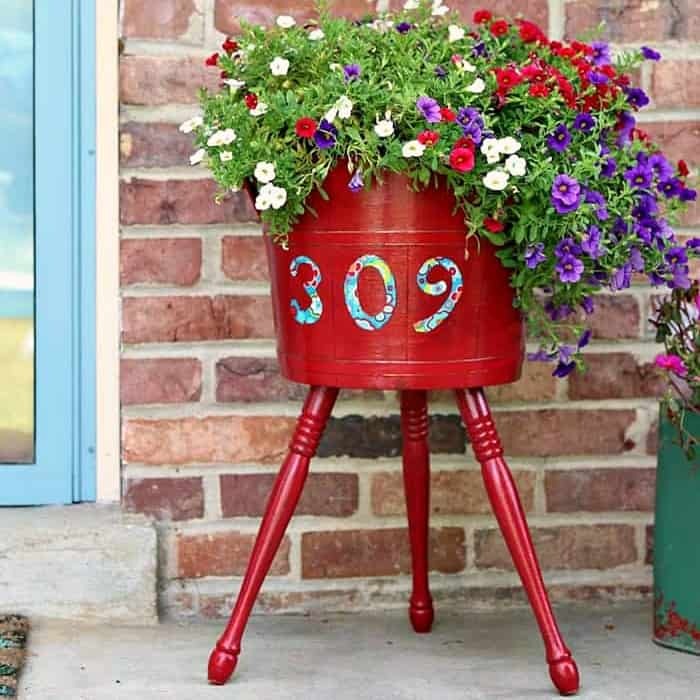 The furniture gloss formula really makes the red paint pop and the outdoor Mod Podge formula protects the planter from the weather. The regal red decoupage planter adds curb appeal plus it has our street address. Having your street address prominently displayed is a good idea. You want emergency responders……or Publishers Clearing house to be able to find you. 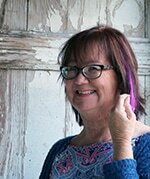 Mod Podge fun facts: Invented by Jan Wetstone in 1967, the summer of love. 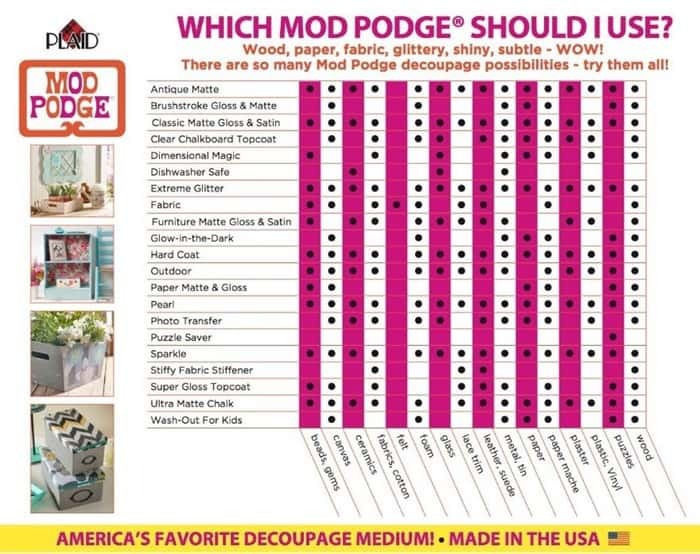 Now there are over 20 formulas of Mod Podge. 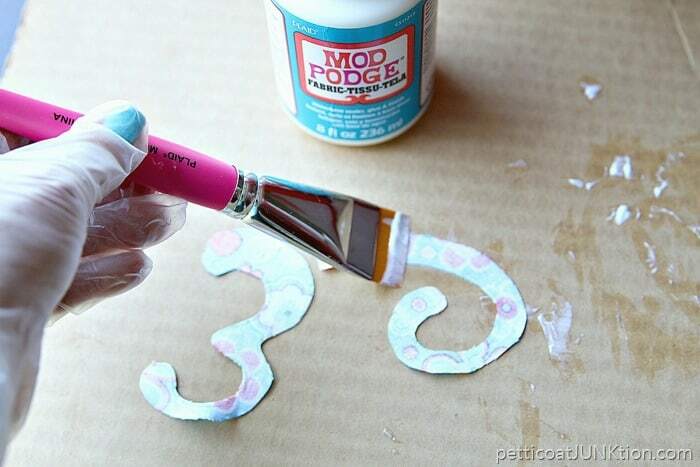 Mod Podge is an all-in-one glue and sealer. The waterbased, non-toxic formula is manufactured near Atlanta by Plaid Enterprises, Inc.
What do you think of the challenge project? 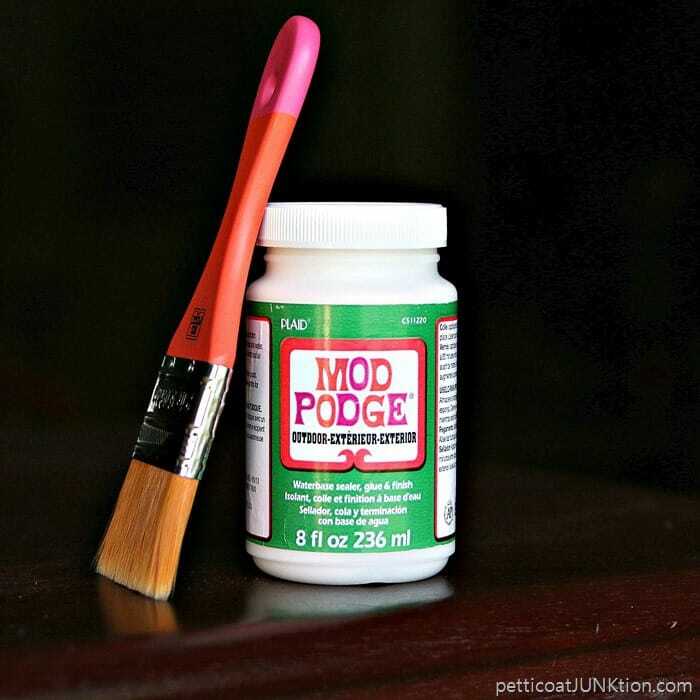 Did you know there were so many Mod Podge formulas? How about Glow-in-the-dark? I bet that would make a cool project for Halloween. Be sure and sign up for the Plaid Newsletter. It features new products and fun project ideas. Love this idea . Numbers looks perfect. Thank you for sharing with us at #HomeMattersParty. We would love to see you again next week. Oh this is so cute! What a charming way to show your house numbers! adorable! i love anything that has to do with increasing my curb appeal, and let me tell you, this piece in its before state would NOT have been put outside my house. but you made it gorgeous and i love it with the plants! Thanks so much for the inspiration!! 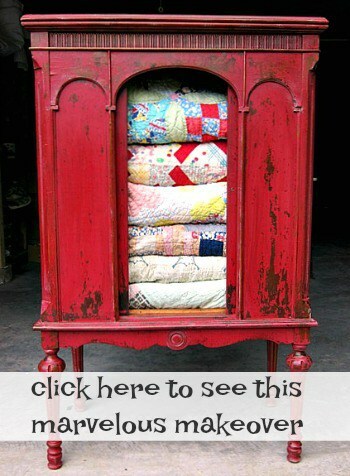 Love this idea and I know exactly where I can get a piece just like this! So fun! Now I want one on my porch! Love this!! The red color is beautiful, and I also love the addition of the ‘quirky’ looking numbers! That looks really nice! You did a great job. I am green all over, because this is so beautiful and I want one. LOL! Your planter is so pretty! It’s such a great idea – now you’ve got me wanting to hunt up something I can use near my front door! Really great idea to transform something like it was to something so cheery! I love the red and the numbers really add to it as well. Enjoyed it! 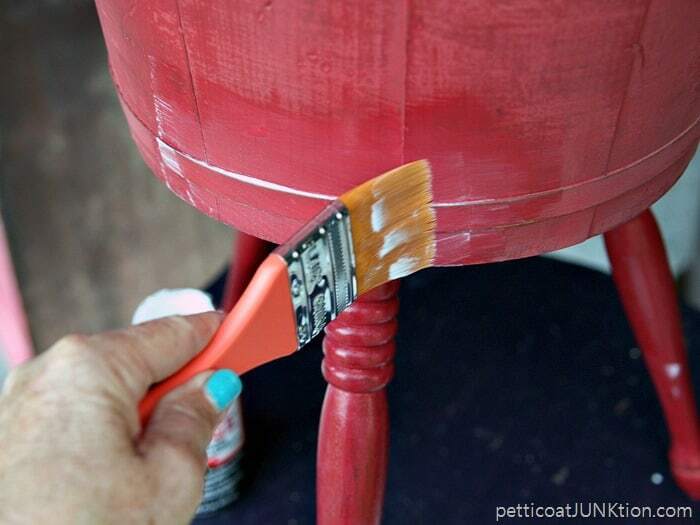 Love the red with decoupage. You are soooooo talented. That is an awesome idea! I just love it! So colorful and cheery! Thanks for sharing it! Gee, Kathy, I wish I had your insight and creativity. 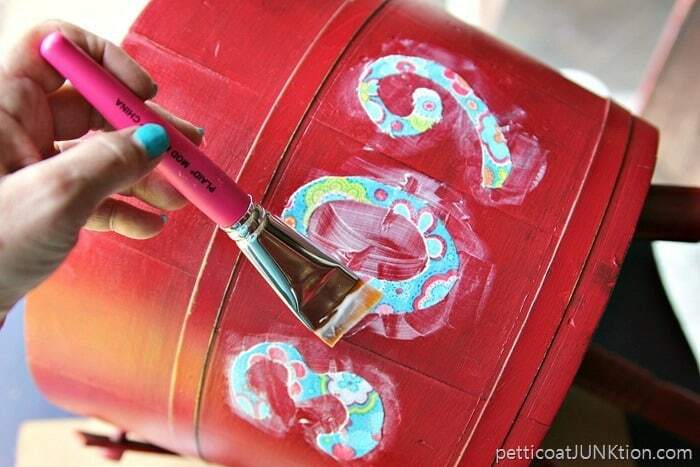 I just gave up a planter/sewing chest/ashtray holder like that. I took it to the consignment shop because I’d had it for over a year and didn’t do anything with that. It would have looked so cute like this on my front porch! Woe is me……………. I love the way you made the numbers! 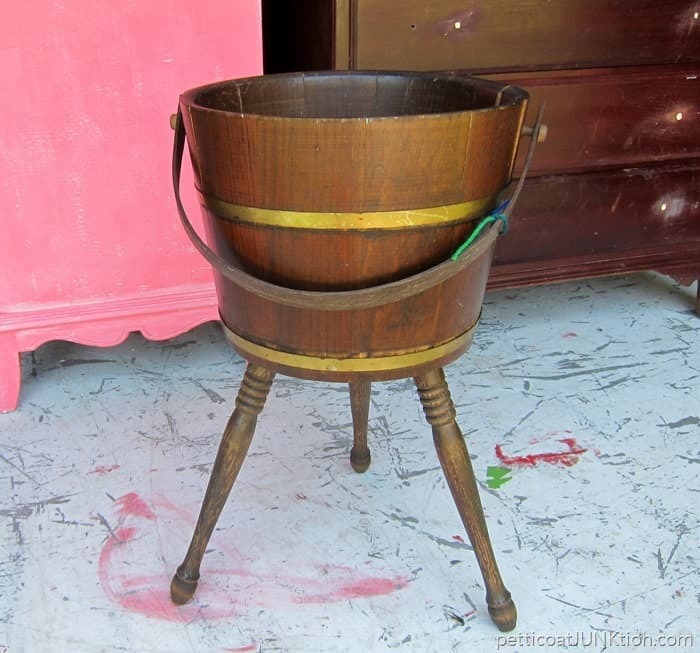 See – I need you to come look through my Junk and make suggestions….Thanks for sharing! The planter s very pretty! Great job as always. Just love it! Color is great and the fabric numbers make a great accent. How cute. It still goes to show, you CAN’T throw anything away.